As a pet owner, you know accidents happen. Whether you’re potty training your puppy or forgot to clean the litter box, sometimes, pets go where they aren’t supposed to. Fortunately, owning a pet doesn’t mean you have to live with stained carpets and foul-smelling furniture. The pet stain removal experts at Yaeger Rug & Furniture Cleaners in Webster, NY, explain how to clean up the mess and preserve your furniture. If your pet had an accident on the floor or furniture, it’s important to act quickly to prevent deep-set stains and neutralize odors. First, place a thick layer of paper towels over the wet area with a layer of newspaper on top of that. If the soiled area is on a rug, lift up the mat and place paper underneath as well. Stand on the padding for about a minute. Replace the dirty papers with fresh ones, and repeat this process until the area is nearly dry. To encourage your pet to go outside or use their litter box or puppy pad, place one of the urine-soaked towels in their designated bathroom area. Next, rinse the wet area with an odor-neutralizing solution. One of the best solutions is a mixture of two cups white vinegar, two cups lukewarm water, and four tablespoons of baking soda. The vinegar neutralizes the foul smell without damaging upholstery or carpets. You can either pour the solution into a spray bottle and spray it in the area or pour the mixture directly on top of the soiled spot. Let the solution sit for five to 10 minutes before blotting it with a soft cloth. If you come home to an accident that may have happened several hours earlier, you’ll need to take a slightly different approach. Soak up as much moisture as possible, just as if the stain were fresh. Then, sprinkle the area with baking soda, and let it sit overnight. In the morning, spray the area with white vinegar. As the compounds interact, you may see a little frothing, which is normal. Let the solution sit for a few minutes before blotting. To remove old or deep-set stains, it’s always best to hire a professional carpet cleaner. 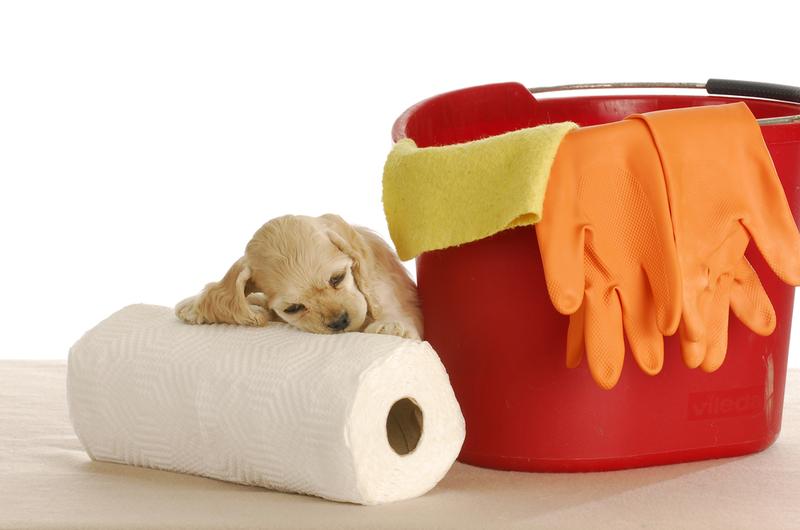 Never use a steam cleaner for pet stain removal. The heat will permanently bond the odor and stain with the human-made materials. Also, be cautious about using store-bought pet stain removal solutions. These aren’t always effective and may damage your carpet or fabric. Pet stain removal specialists have the equipment and training needed to clean the area effectively without causing damage. For professional upholstery and rug cleaning in the Rochester area, contact the experts at Yaeger Rug & Furniture Cleaners. Over the past 60 years, they’ve established a reputation as one of the region’s most dependable, customer-oriented cleaning services. Call (585) 671-7390 to schedule an appointment or visit the website.